These are the instructions for the first version of the BibleBox which are no longer supported, but remain here for those still using the TP Link MR3040 device. Instructions on setting up the new BibleBox will be available soon. These instructions are based on the TP Link MR3040 ver 2.3 with Sandisk Cruzer Fit Micro 8GB usb drive. 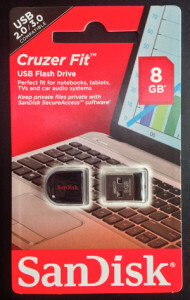 If you use different brand USB drives note that you will need to extend times stated for setup. Particularly if using CHEAP USB drives…. MOST of the problems people have when installing are because they havent followed the instructions as written or when using different hardware, ended the setup process before completion. BibleBox files – alters functionality and rebranding BibleBox – zip file – 4.9MB. when prompted to login use the default TP Link username and password which is, username = admin, password = admin The TP-Link web admin screen for the TP-MR3040 will open. Click the Upgrade button and click OK to confirm the upgrade. The TP-Link progress bar in the browser window will indicate that the MR3040 upgrade has finished but WAIT, the upgrade process will take around 15 – 20 minutes so JUST SIT TIGHT. 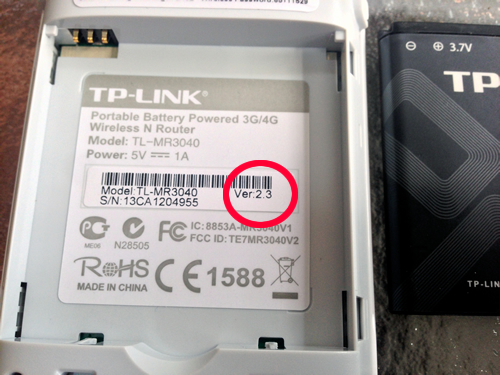 During the firmware flash DO NOT unplug the power or ethernet cable from the TP-MR3040 or computer! Dont be fooled by LEDs flickering or staying off – be patient. After a couple of minutes the web browser will give you a “Page not Available” message. Just wait. After around 15 – 20 minutes change your IP address to 192.168.1.2 and try with your web browser to access the BibleBox router on 192.168.1.1. If the librarybox page appears this indicates that installation is complete. If it doesnt wait a few more minutes, turn your wifi on, connect to “Librarybox – Free Content” and reload the page. I like to confirm everything has installed by connecting to the Librarybox wifi with my phone and checking the page loads. Once the TP-MR3040 has finished the firmware upgrade and Librarybox install, turn it off and remove the USB drive and ethernet cable. On your computer, unzip the install_BibleBox file you downloaded to your computer, you will see 3 folders – Content, Config and Shared. Copy these three folders and their contents to the “Librarybox” folder on the BibleBox USB. 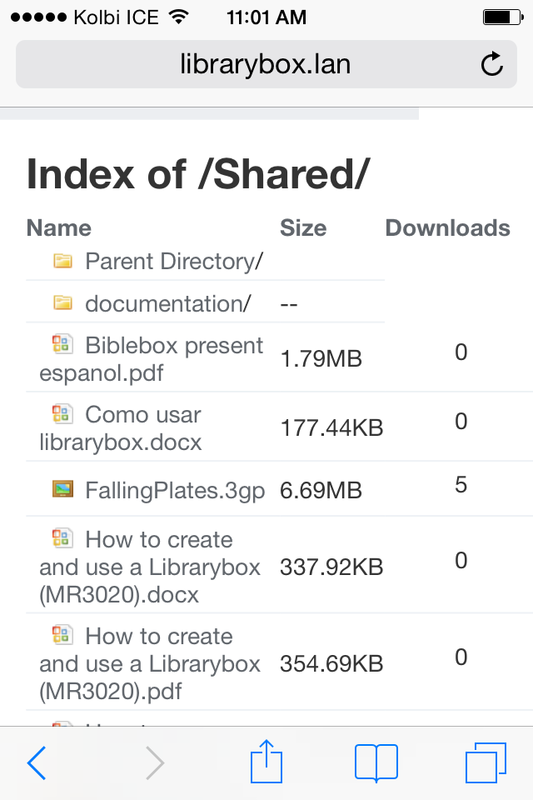 Now you are ready to copy your files for sharing to the /BibleBox/Shared folder. There is a starter folder of shareable files available to download here (100MB, mixed files – audio, video, text, images). 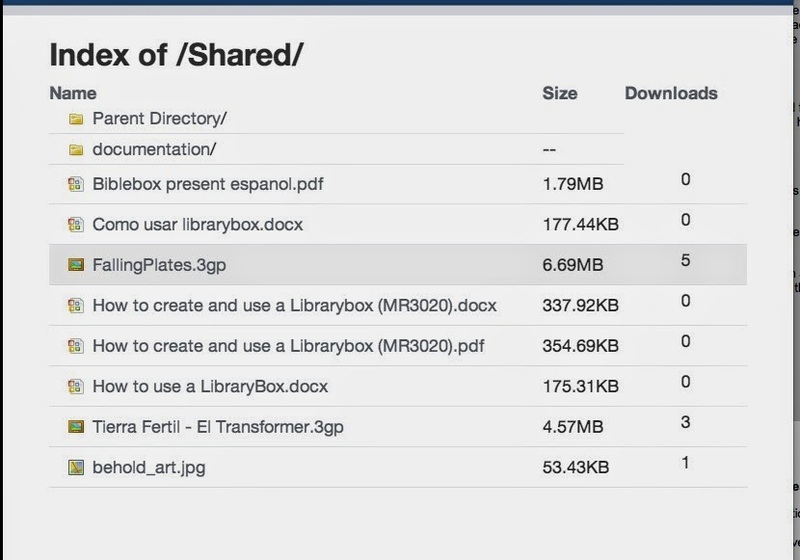 You can copy files into the different folders in Shared, or just place them into the Shared folder itself. NOTE – if you modify the location or names of any of the Shared folders on the USB you will need to edit the html files on the webpages so the hyperlinks to those Shared folders continue to work correctly. Put the BibleBox USB back into the MR3040 and turn it on. It takes about 4-5 minutes to start up and be ready to share files over wifi. Check out how your mobile device handles the various files you are sharing on the BibleBox. Now your BibleBox is setup you need to secure access to the administration of the BibleBox router. 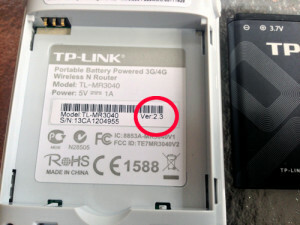 This isnt securing the wifi network, but securing access to the settings of the device. you can also set the date and time during this process. While here, select option 2 and set the date and time. Brendan serves with MAF in Haiti, supporting and leading various Technology and education projects. Here are his instructions for modifying the look and feel of the shared files section using CSS. First, put your BibleBox USB drive into your computer and copy the “dir-generator.php” file from the CustomCSSDirList folder to the root folder of your USB drive. That replaced the default dir-generator.php file with the customized one, which modifies the output of the directory listing and points to the three CSS files to style the output. It also activates the filetype icons and cleans up the file listing a little. 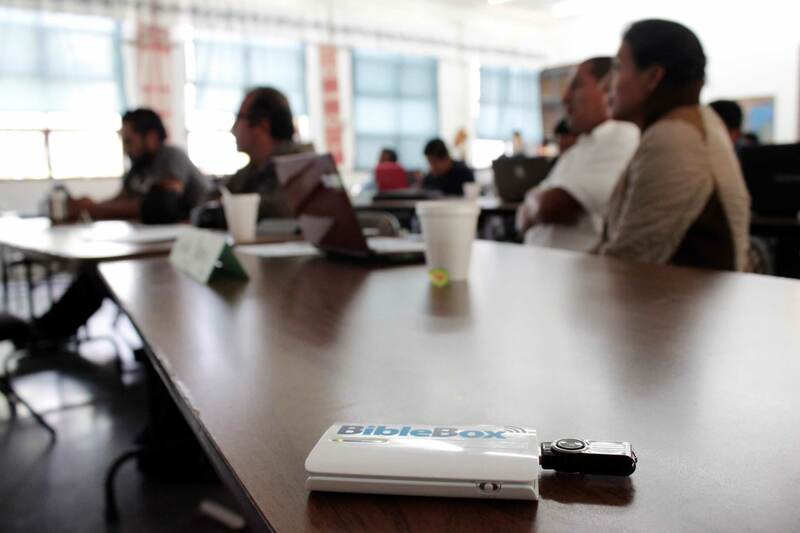 The BibleBox can be setup with FTP access which makes it very easy for you to transfer new files for sharing to it with being physically connected, but through the BibleBox wifi connection. Every other button is a clean exit. Powering up and connecting to the Biblebox from Martin Lange on Vimeo.